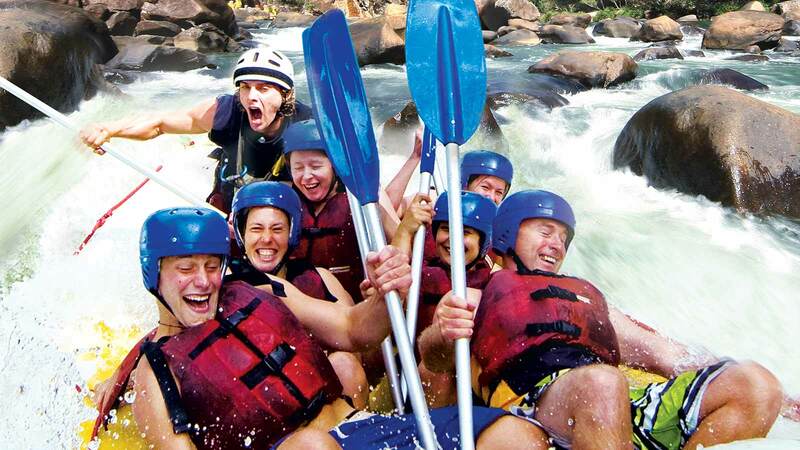 Get swept away by the current with a full adventure packed day at Australia’s premier white water rafting rapids on the Tully River. With transfers departing from Mission Beach, your experience also includes a true Aussie BBQ lunch. Just a short drive from Mission Beach, enjoy a day of roller-coaster style rafting on Australia’s premier white water rafting rapids. Guided by trained certified rafting experts, you’ll glide and bump your way through a series of natural waterslides, drops, whirlpools, all the while navigating giant boulders and the river’s water ways. And while you’re enjoying your delicious BBQ lunch, experience Australia’s pristine rainforest in a much more intimate manner by checking out the numerous waterfalls, exotic wildlife, sacred Aboriginal cultural sights, basalt formations, and incredibly lush flora. Tour departs your Mission Beach accommodation at 8am and will bring you back at approx. 4pm.